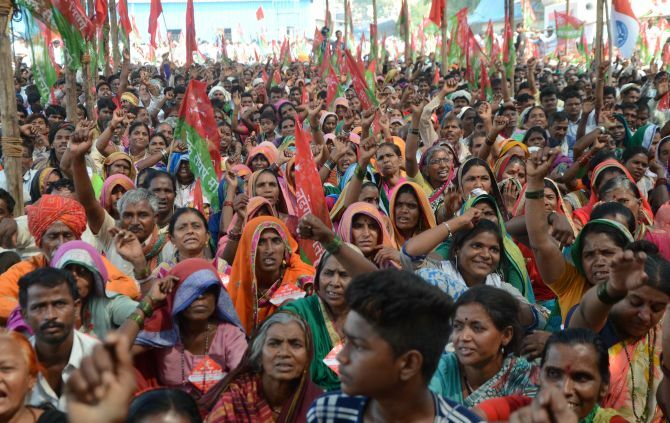 Tribal farmers called off their protest on Thursday after the Maharashtra government agreed to fulfil their various demands, including transfer of land rights, marking the end of second mega agitation in Mumbai by cultivators in eight months. A delegation of protesting farmers met Chief Minister Devendra Fadnavis to discuss their demands and called off their protest after receiving a positive response from the government, a member of the team said. 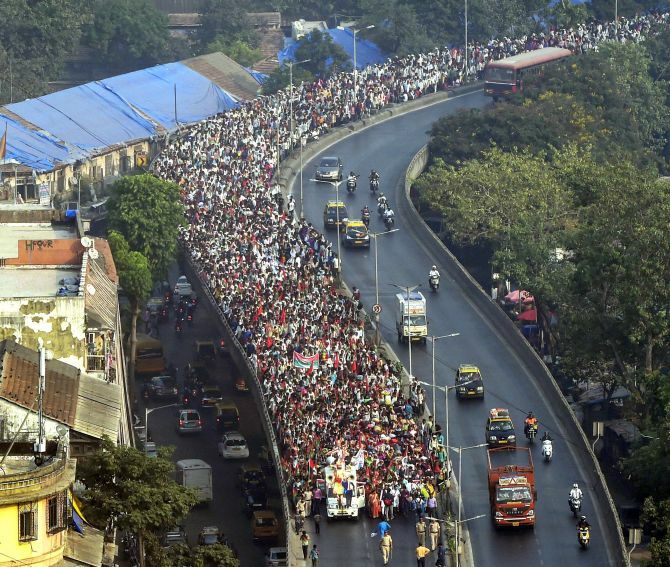 Thousands of tribal farmers marched from adjoining Thane district to Azad Maidan in South Mumbai over two days seeking redressal of their grievances, which include compensation for drought and transfer of land rights to tribals. Fadnavis assured them of transferring land rights within the next three months. A committee headed by the Chief Secretary will take regular review of the progress, he told the delegation. 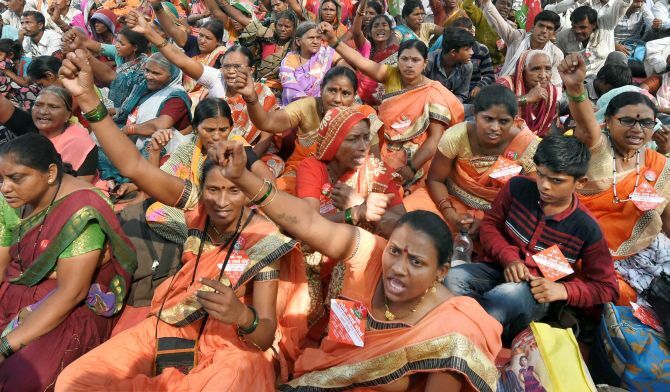 Satisfied with the assurance, Pratibha Shinde, general secretary of the Lok Sangharsh Morcha, which was spearheading the stir, announced in the evening that the agitation has been call off. As part of the agitation, tribal farmers from Khandesh and Vidarbha regions of the state reached Azad Maidan on Thursday morning. They had started their march from Thane on Wednesday evening and halted for the night at the Somaiyya Ground in Mumbai's Sion area. Girish Mahajan, Minister for Water Resources, tried to hold talks with protesters. However, they declined to talk to Mahajan and asked him to send Tribal Welfare Minister Vishnu Savra to discuss their demands. A delegation of 20 representatives led by Shinde later met Fadnavis and their meeting went on for over two hours. Fadnavis assured the tribal farmers that they will become owners of the land they are cultivating or are in possession of, according a release issued by the Chief Minister's Office. Their name would figure in the 7/12 extract (a key land ownership document), said the release. Along with the CM, principal secretaries from tribal welfare, revenue and forest departments also took part in the discussion. Fadnavis also spoke to district collectors via video-conference on issues raised by the delegation. Shinde said the government has accepted almost all the demands of the protesting tribal farmers and given assurance in writing to fulfil them. Talking to mediapersons, she said the chief minister has agreed to clear the land ownership claims made by the tribal farmers. She said there are 2,31,556 cases where land ownership is not with the tribal farmer cultivating the land or having its possession. "Because the land is not owned by the person concerned, he or she is not eligible for a bank loan, loan waiver benefits or drought relief," Shinde said. The chief minister assured the tribal farmers that suitable changes will be made in 7/12 extract to ensure they become eligible for loans, she said. The State Level Bankers' Committee (SLBC) will also be informed about the changes to facilitate bank loans for tribal farmers, she said. Mahajan said the chief minister has agreed to fulfil all the demands put forward by the tribal farmers, including those that need approval from the Union government. Mahajan said instead of giving 'khavti karje' (temporary loans) whose recovery is low, Fadnavis was of the view that the tribal farmers should be provided with subsidy or financial aid. Savra said 3.6 lakh claims of land rights were received by the government, of which 1.74 lakh were settled in favour of the tribals. Magsaysay Award winner Rajendra Singh, also known as Waterman of India, was among the marchers. He blamed the government for the drought, which he termed as 'man-made'. The farmers were demanding implementation of the Swaminathan Committee report, which suggested that farmers must have assured access and control over resources such as land and water. They are also demanding increase in minimum support price (MSP) for crops and a judicial system to ensure its implementation. The farmers were also demanding proper implementation of the loan waiver announced by the BJP-led government in the state last year. 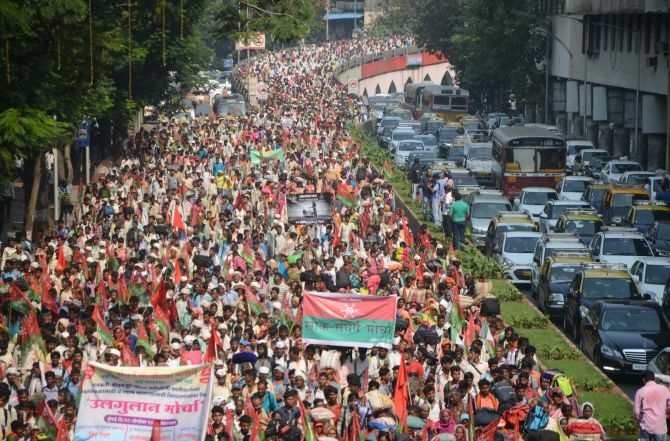 In March, thousands of farmers, led by the Left-affiliated All India Kisan Sabha, took out a 180-km long march from Nashik to Mumbai to press for their demands. That time too the state government had accepted most of their demands.